The Gemini Ceramic Wall and Floor Tile Collection feature exclusive ranges of innovative designs, from classic to contemporary. Looking for natural Stone? 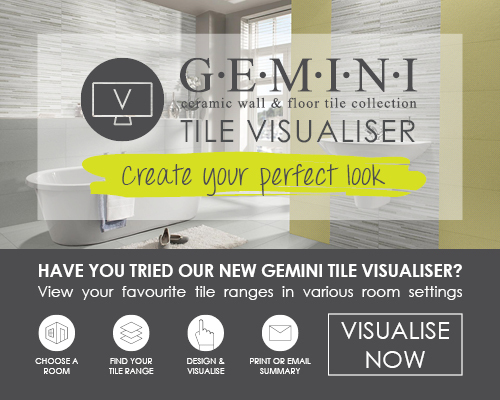 With over 200 different products in the Gemini Marshalls Collection alone you’ll be sure to find a tile to suit your needs at CTD Eastbourne. Hot on the latest tiling trends? Always up to date, you’ll also find the latest in tile trends on offer such as wood effect, marble look and natural stone effect and much more so don’t hesitate and discover the latest tile ranges in store today. As the UK's number 1 for trade, we pride ourselves on delivering what trade professionals need, including easy access to the latest products from well-known brands such as Rubi, Weber, Schluter-Systems, Lithofin and many more and CTD Eastbourne is stocked to the brim. Don’t forget you can also register for a trade loyalty card inside the CTD Eastbourne trade centre. So there you have it, a little insight into what you will find if you head down to CTD Eastbourne today! We look forward to welcoming you into our new store and hearing about your future projects.